Over at Oliver and S, the team are celebrating their 10 year anniversary, as well as the release of pattern number 50! I have been sewing with these patterns since my eldest was 4 years old and they are an integral part of why my love of sewing has developed over the years. If you have never sewn with an Oliver and S pattern, there are some free ones to give you a taster on the website. You will soon see how clever the patterns are and how easy the instructions are to follow. Liesl is capturing lots of memories in her anniversary blog posts, and that got me thinking about all the times I have used the patterns in the past few years. I browsed my photo library and then started grouping the patterns together to see how many times I have used them. 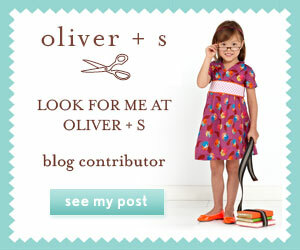 It is safe to say that my girls have grown up wearing Oliver and S and will continue to do so for many years to come! 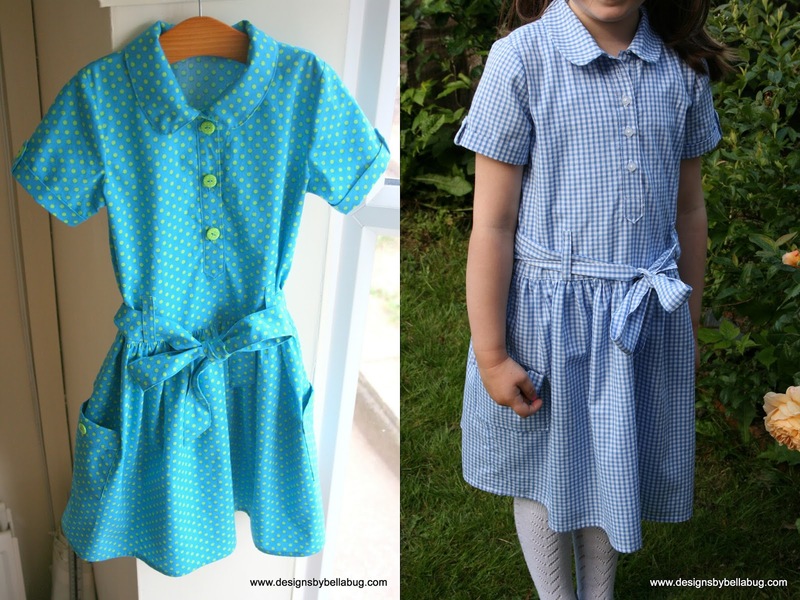 Some of the clothes were made for specific reasons, be that a play or a dress up day at school. Some for special birthdays (well, all birthdays are special, but you know what I mean), some for gifts. Looking at the photographs for me bring back so many evocative memories. If you will indulge me, I wanted to share them with you. One of the singles patterns. Only made once but it looks lovely on. This is one of those sewing memories. 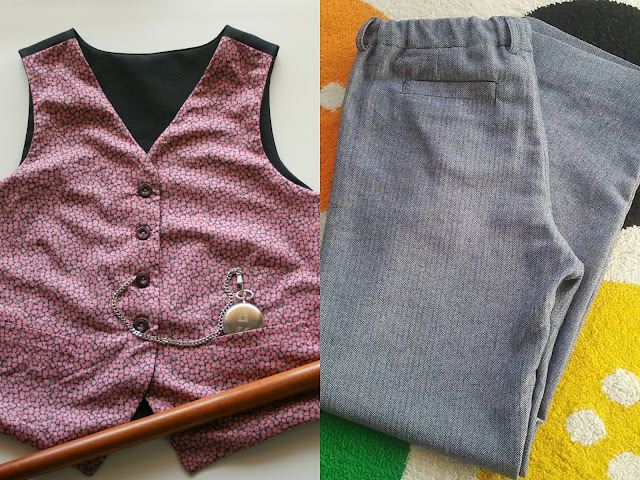 I made the waistcoat and trousers for my eldest when she starred as Willy Wonka for a school production. I didn't own the pattern before but knew when I got my costume requirements, that I needed it! If you know someone who is expecting a baby, this is an absolute must-buy! These pants were made for a school friend who had a baby boy and while I didn't make the jacket from the pattern, I knitted up a tiny sweater to go with them. I may be using this pattern again in the near future as a few friends are expecting, and I can't wait to make the full set. My daughters first true love! She wore the purple version constantly. Whenever it was clean. Sometimes when it wasn't! 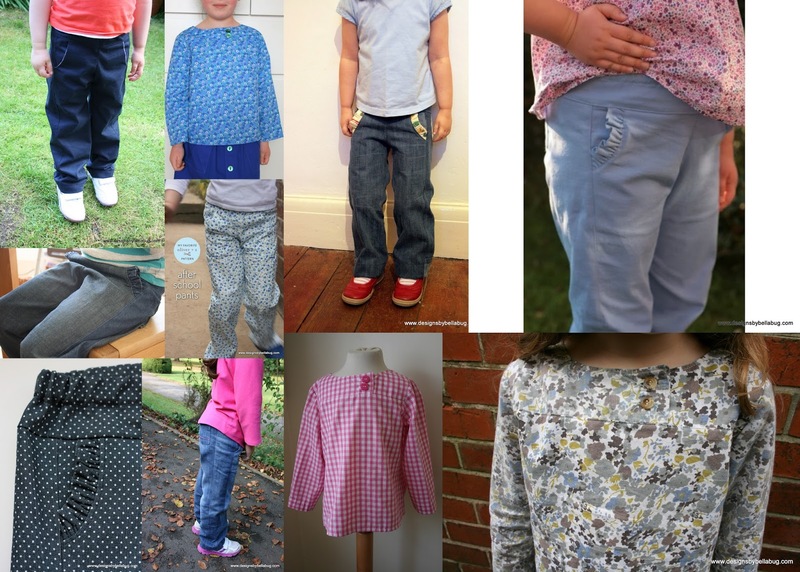 One of my all time favourite patterns are the After School Pants. 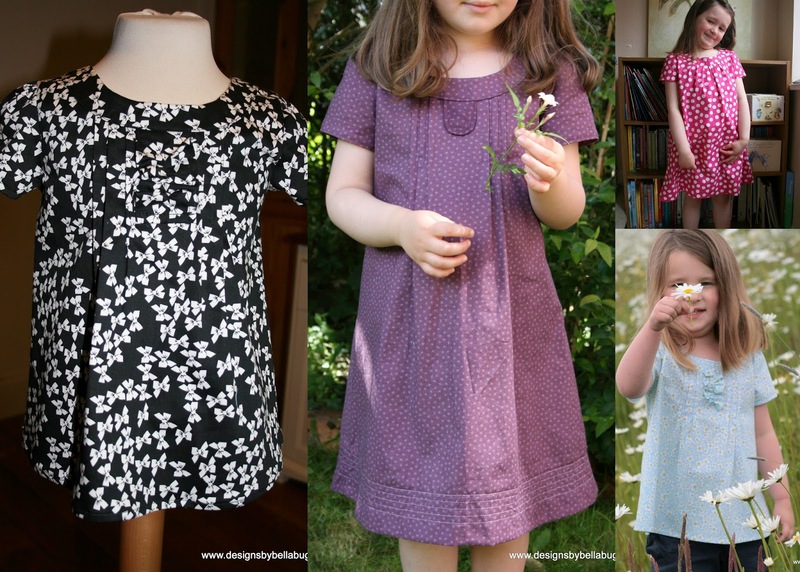 There is testimony to that on the Oliver and S blog, where I was honoured to be asked to write about them in the Favorite Patterns series. They make fantastic jeans and are very hardwearing with all those sturdy side seams, yet girly enough for my two with the optional ruffles. Something I never dreamt I could make was a proper warm coat. This pattern held my hand all the way through and I jumped with joy when the project was completed! Ahh the beautiful Music Class blouse makes me smile everytime. The sweet peter pan collar and girly pleats make this a sew to be proud of. 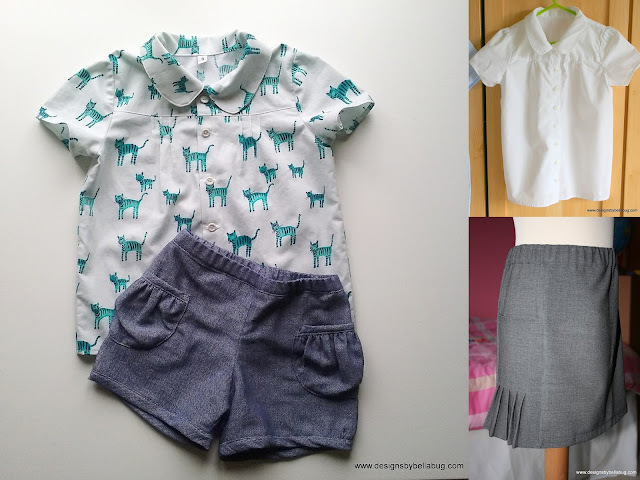 Both the skirt and blouse are part of my core school uniform sewing patterns. I have made more versions of this that I can count. Another staple for school uniform in our house. I have never made this as a regular dress and probably should before my time runs out. Two of these dresses were gifted. I have made it with or without the elastic in the hem and made a themed fox version for the Gingerbread Man play my little girl took part in at nursery. 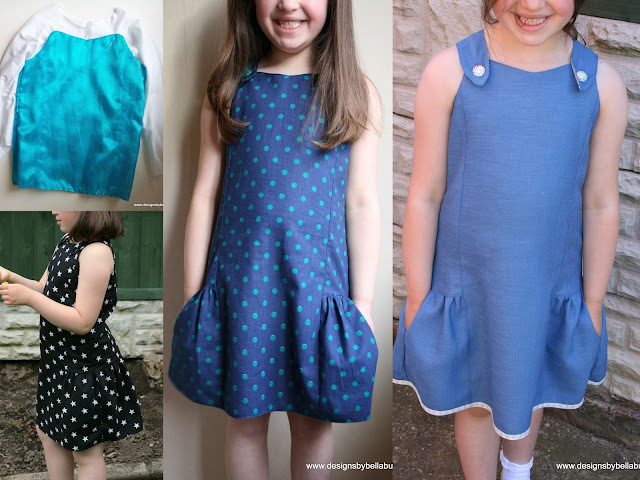 My favourite was the blue dress in the centre photo. Every summer dress for school has been made using both versions of this pattern. The pockets are roomy and hold many treasures (or sometimes just tissues). 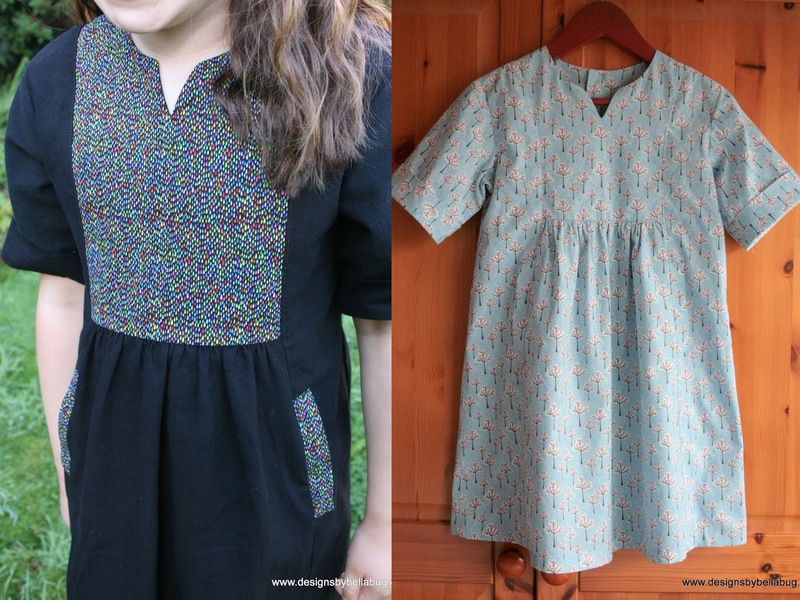 The instructions were the first placket instructions I ever tackled and I just wanted to shout 'Yes!' from the rooftops once it was finished. Such a beautiful pattern and one that has become a firm favourite for many people. The Birthday Dress! How could this not be the most perfect pattern for birthday parties and celebrations. I thought I had made more of these, and am shocked that I have only ever sewn it once. I have pulled out the instructions countless times for the invisible zipper installation, because it makes perfect sense of a tricky sewing step. Maybe that is why I think there should be more dresses! I came to this pattern quite late on and bought it on the basis of the gorgeous shorts that kept popping up in the Flickr group. The shorts are so satisfying to make and the top is one of those things that I didn't think I needed in my life, but once I had made it, I realised it was an absolute gem. I simply must make some more of these cargoes! They are quite time consuming but all those small steps make a fantastic pair of pants. The tee I have made up a few times, even using sweatshirt fleece as a quick sweater for Scouts camp when I discovered we needed one the night before. The first of the original designs and one of the prettiest sundresses to boot. The pink one with its matching dolly sized dress, was a birthday gift to a school friend and the cream Kokka print was the first dress I ever sewed L as a toddler. I use the dress view as a nightgown and the skort as school uniform. I have only sewn the top up once and it makes a lovely summer vest. 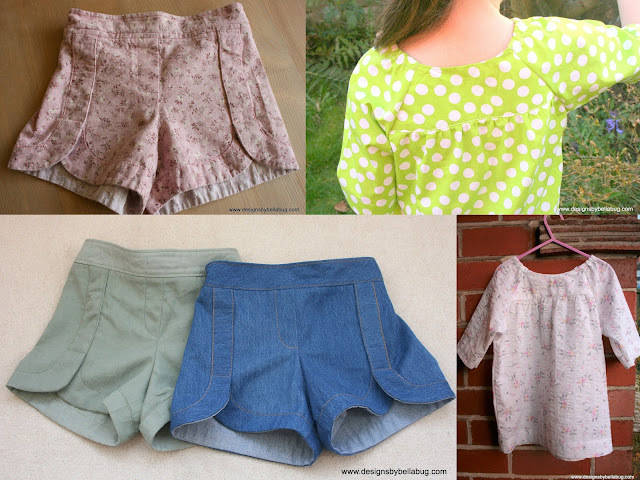 The shorts can be sewn on their own without the skirt and they are nice and simple for pairing with summer tops. I love the girly-ness of this skirt. It is fully lined, making the finish look professional, and the waistband casing is genius. The top I have only ever made once, but absolutely loved it. It has gone off to warmer climates now so it has a second life. 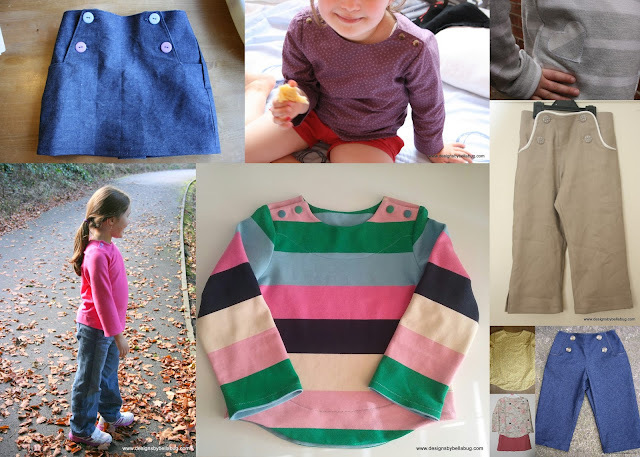 I ran out of time to make more of these because the pattern sadly only goes up to age 5, but like the Puppet Show shorts, it look so cute on young children, so my advice is, make it while you still can! 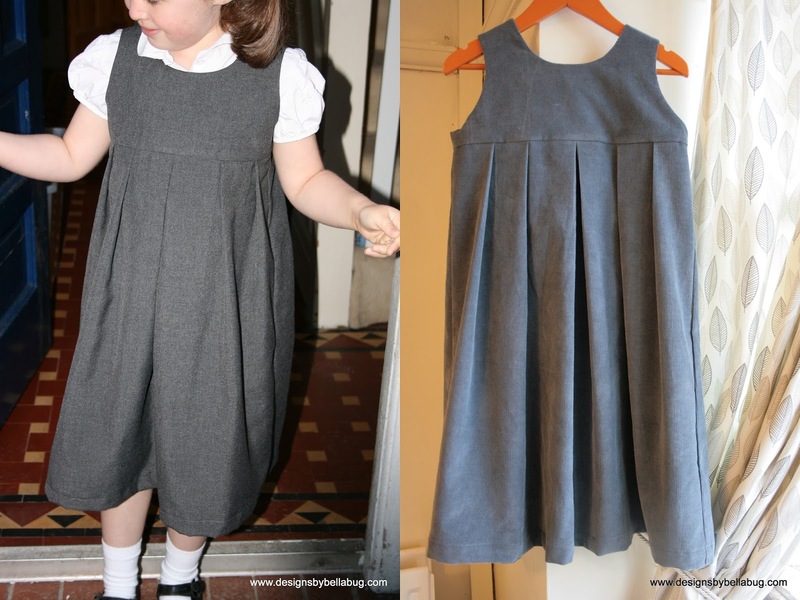 We don't have a lot of warm weather over here and to find a dress pattern with longer sleeves, that looks as smart as this one does, is a pure joy. The girls look lovely in both of these versions and I always get compliments whenever they are worn. The lunchbox tee has become the go-to top in our house. We wear the short sleeved versions ALL THE TIME! 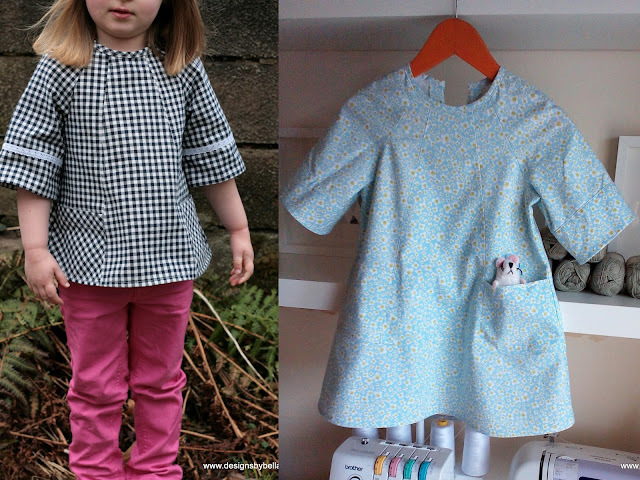 (Boo and I are both in the Bento tee - the adult version - now) I have made the long sleeved tee into a dress as well (but couldn't find my photo). 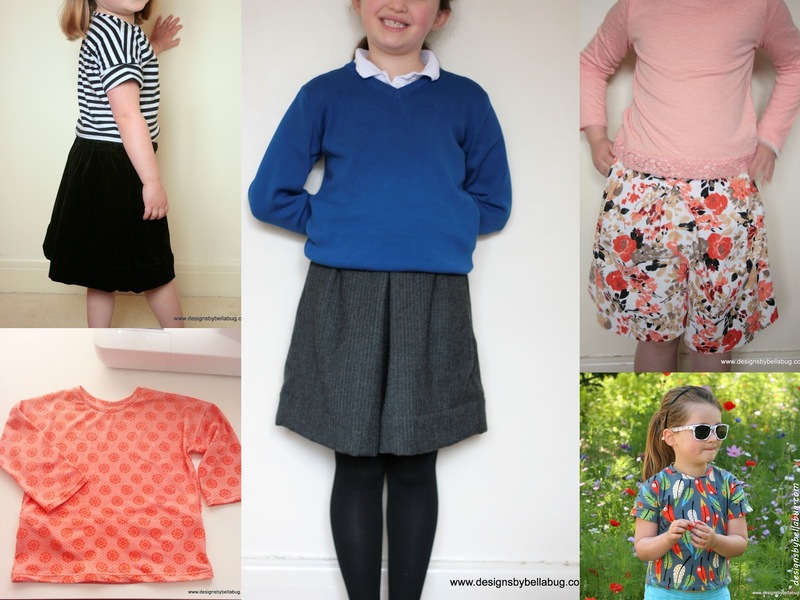 The culottes have been made twice for school, below are the wool pair that kept her snuggly last winter. The black pair were made from velveteen and the flowery pair from baby needlecord. The ultimate comfy chilling out pants! The grey pair were made from fleece backed sweatshirting as joggers. The other pair were made as pyjama bottoms out of a cotton jersey. I did a lettuce hem on them to match the vest top. They were a big hit! 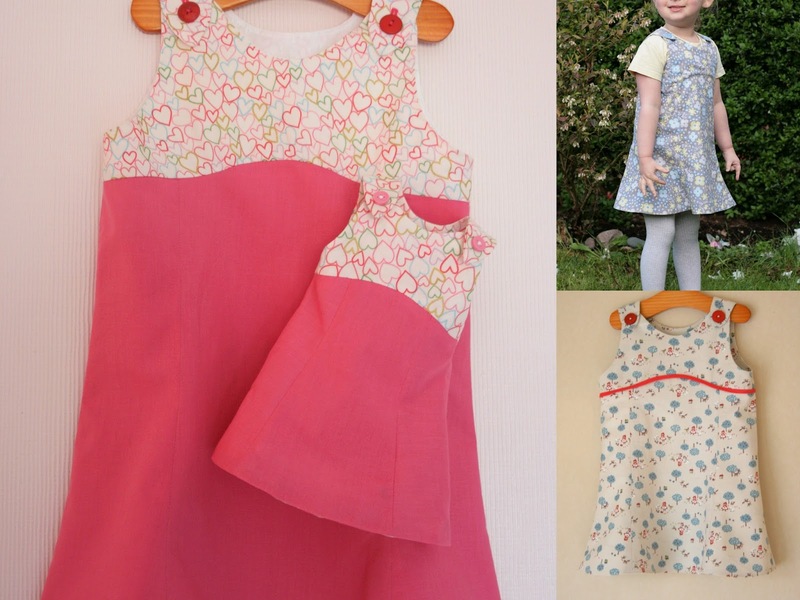 My first ever make was the plain pink tunic top. It was a great introduction to the brand and I took my time learning all the different steps and remember really enjoying myself as I tried out new techniques. 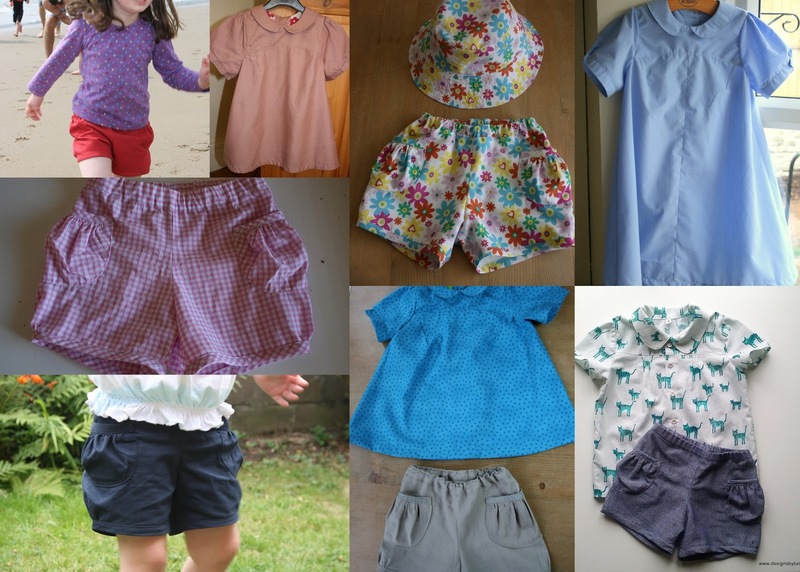 I made the red shorts next and they went on our beach holiday where she ran into the sea fully clothed on the first day! The shorts are fantastic. They are so versatile and look very sweet on. When I made the flowery pair with matching Bucket Hat, I lined them completely so they looked perfect on the inside. This set was a birthday present for a school friend. My most traced off pattern! The skirt, trousers and top all got worn without complaint. The striped top is my favourite. I use the 2+2 skirt as school uniform a lot. It is just so easy to wear. The jacket to this pattern is absolutely gorgeous! Mine was made from a baby needlecord and the attention to detail on the inside is a sewing lesson in itself. This one will test your binding skills. 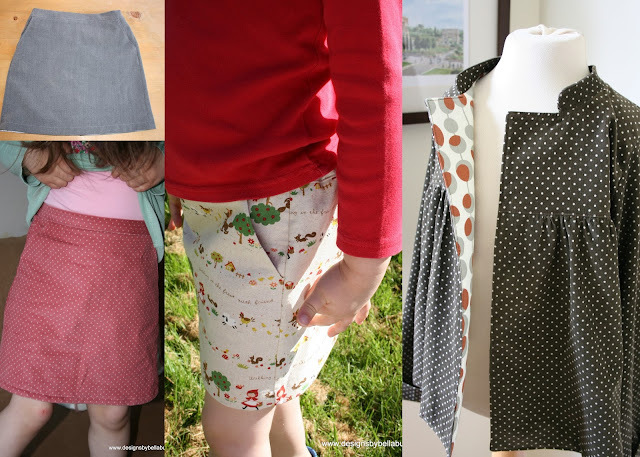 I loved the little printed skirt and it reminds me of a day out in the Peak District eating Bakewell tarts whenever I see the photos. I just love this skirt and will make many more for L. The pockets are very cleverly constructed and the placket makes it stand out. 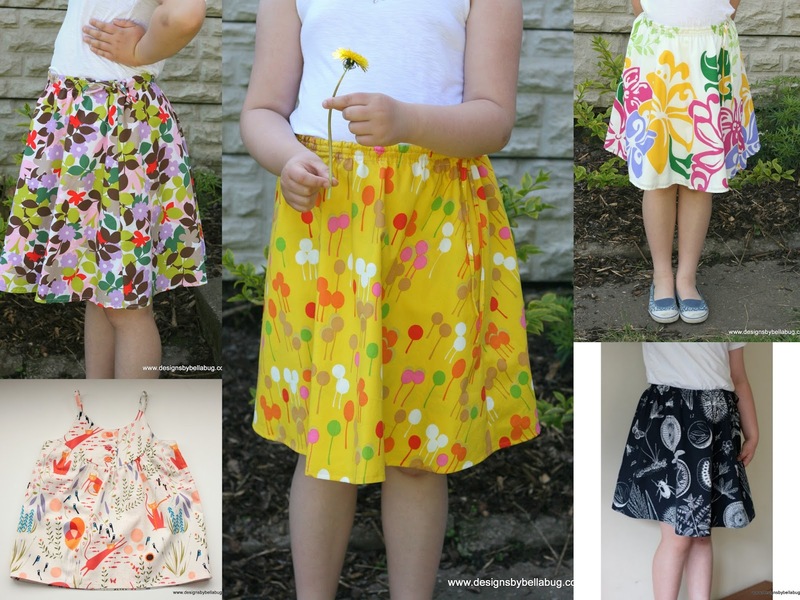 Not just your average skirt! The yellow top was my first attempt at knit fabrics using a large womens tee as practice. I soon got the hang of it and the girls wear the tee's and the longer dresses all the time. How gorgeous is this pattern? This is one I am so glad I made. I love the cut of the dress and the pockets at the bottom. 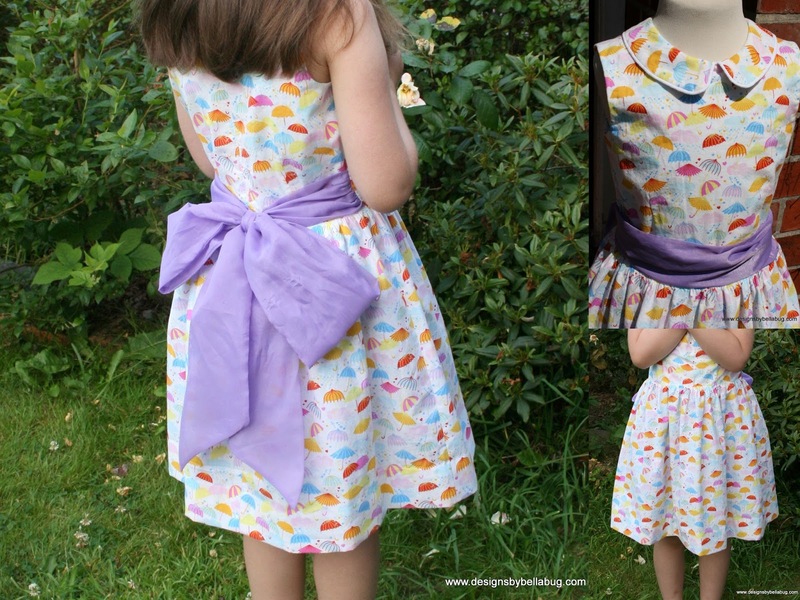 I used a mish-mash of patterns to make a Queen Elsa dress. I used the bodice of the Seashore and attatched it to a Heidi and Finn Tee (the Tulip Tee) which has an all-in-one upper bodice, making the two patterns attach perfectly. I haven't made enough of these by far. 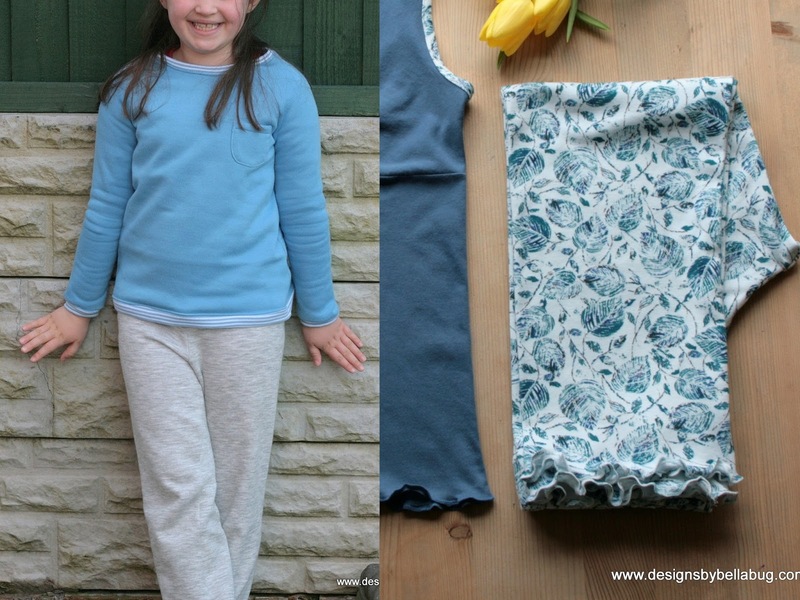 It looks lovely on and the leggings that go with the pattern are a really good fit. 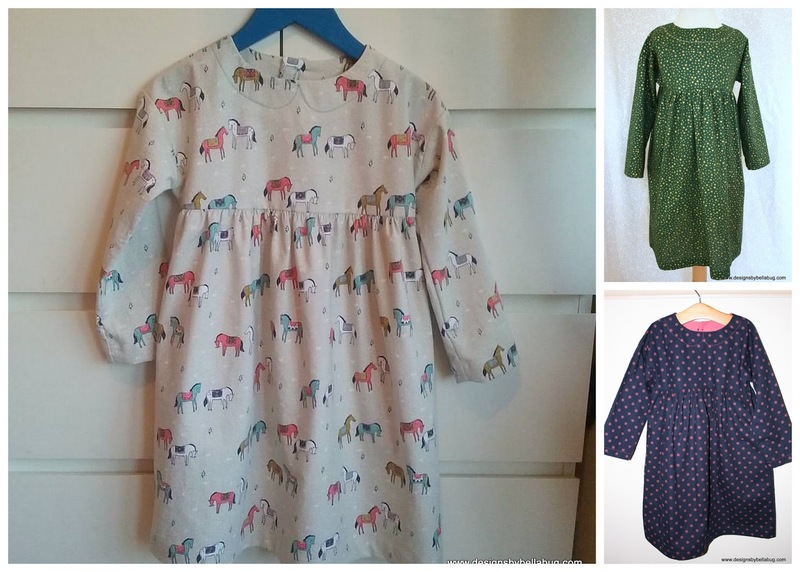 The horse print one was a present for my niece, and the spotty version was Boo's Christmas Day dress one year. 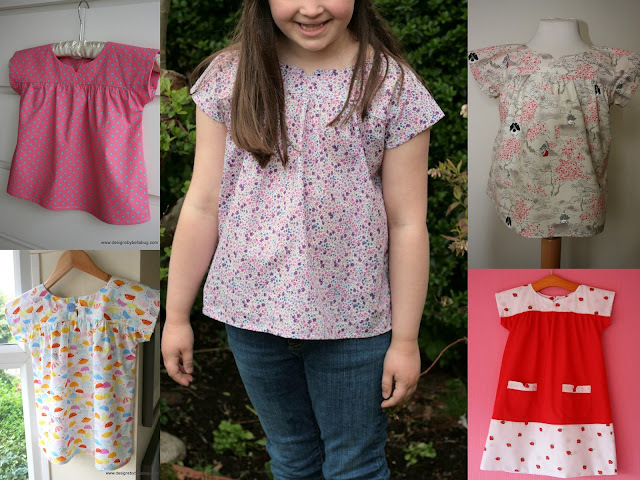 The strawberry print version was the first one I made (and the only dress version, that I can remember making) The tops are easy to make and wear. 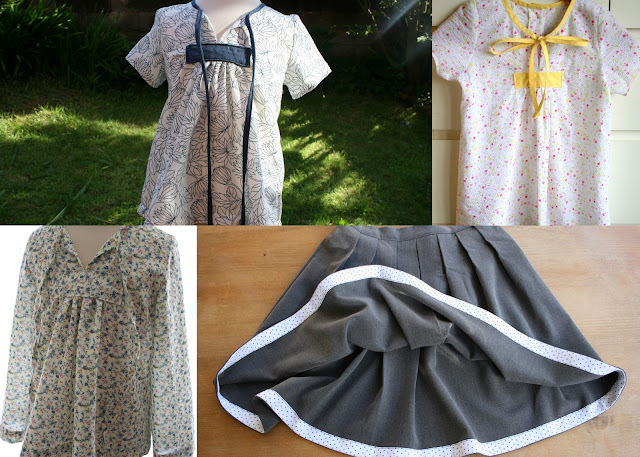 The one in the center is a Liberty print that we bought on a weekend trip to London and is so light and soft to wear. 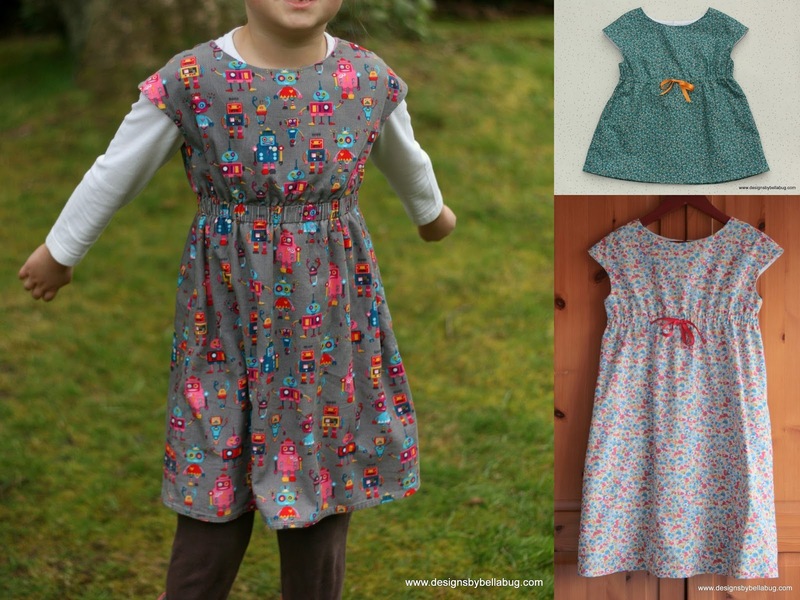 My little scamp loved wearing her robot dress! I have packed that one away and will keep it safe. Such a great pattern. As soon as I saw this pattern, I knew I wanted to make a gingham version. I have a soft spot for that little top with its lace trim. I must put the gathered skirt version on my to-do list as it is the one that attracted me to the pattern and I haven't made it yet! Phew! If you have made it this far, well done! I think spending some time going over my makes has done me some good. I remember why I made some clothes and how I wanted to go back and make some of the other versions. I still have some unused patterns to make as well. Hopefully, this will give me the boost to crack the envelopes open! 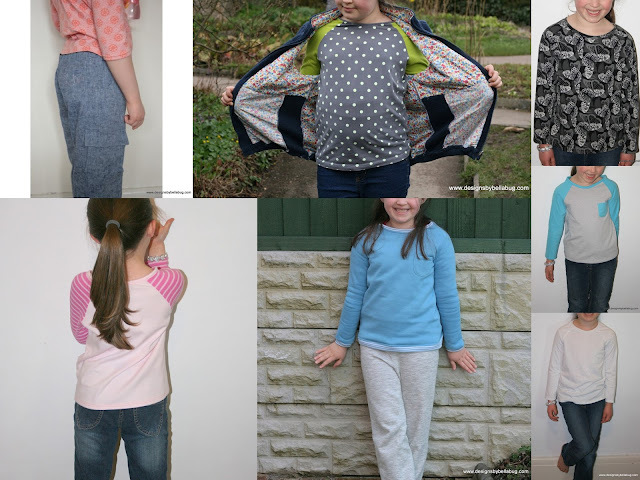 As you can see, Oliver and S patterns have been part of my life for so many years now, where would I be without them! So Happy 10th Anniversary to Liesl, Todd and team and long may it continue! So fun to see! What a great collection of O+S makes you've made over the years! Thank you Rachel! I wish I had more time to sew these days, I miss my kids clothes projects. 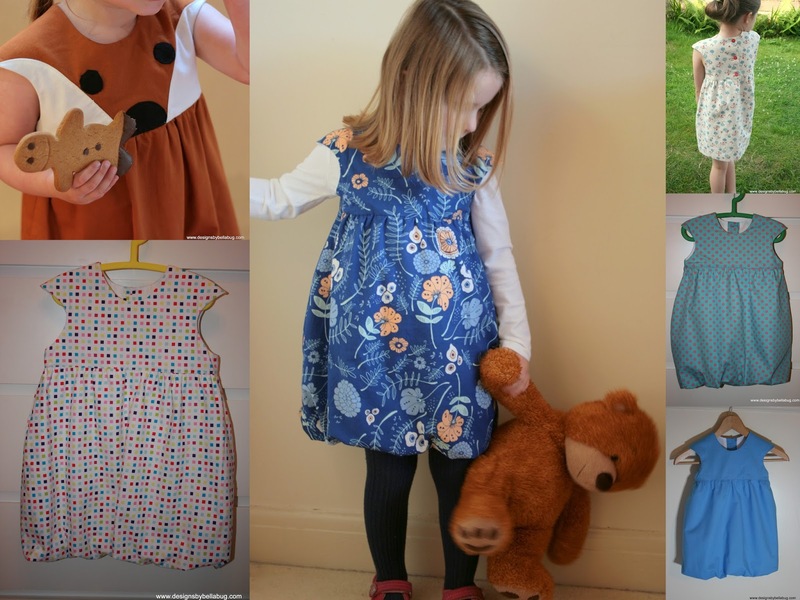 Oh my goodness, so many lovely things! Trixie is still rocking that blue Bubble dress and I have been asked to hand it on to my great niece. The Swing Set top get wear all year round as well, over a skivvy and jeans in the winter. I remember so many of these! 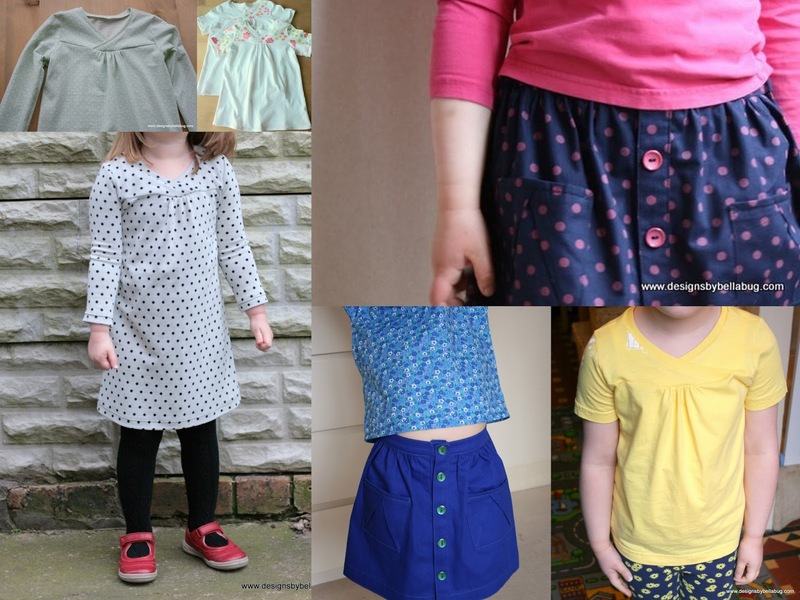 You've made so many lovely things but I think the stripedSailboay and the spotty blue Seashore are my faves. Thank you Masha, I just loved that Seashore dress too. I can't wait for it to fit little sister! 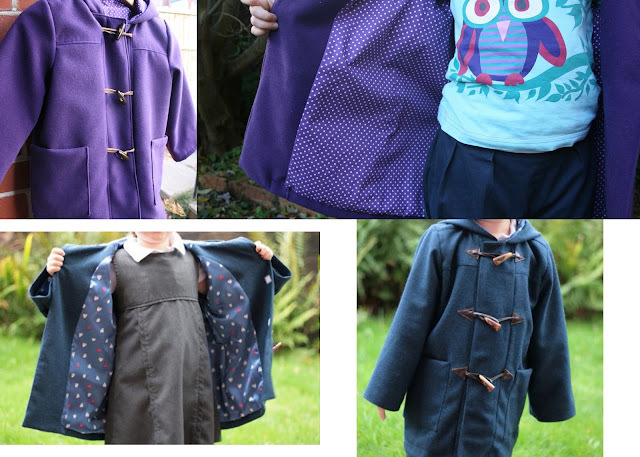 I love the Puppet Show Tunic so much, I'm sad my daughter is too big for it now! Thank you! The Puppet Show will always be one of those patterns I associate with them being very small. I guess in that way it is fond memory to have. I miss the shorts though! Fantastic!!!! I love this post, and seeing all of your beautiful makes! So many of these were inspirational to me when I saw them in the Flickr group or on the blog. Well done! I think that gingham carousel dress is still my favorite, though - I have such a soft spot for gingham, and that's an unexpected pairing. And the lace just elevates it that much more. Who doesn't love gingham! If I ever found gingham seersucker I think I would die of happiness! So many beautiful clothes. I remember searching through that Flickr group and being inspired by other people's makes, yours included. 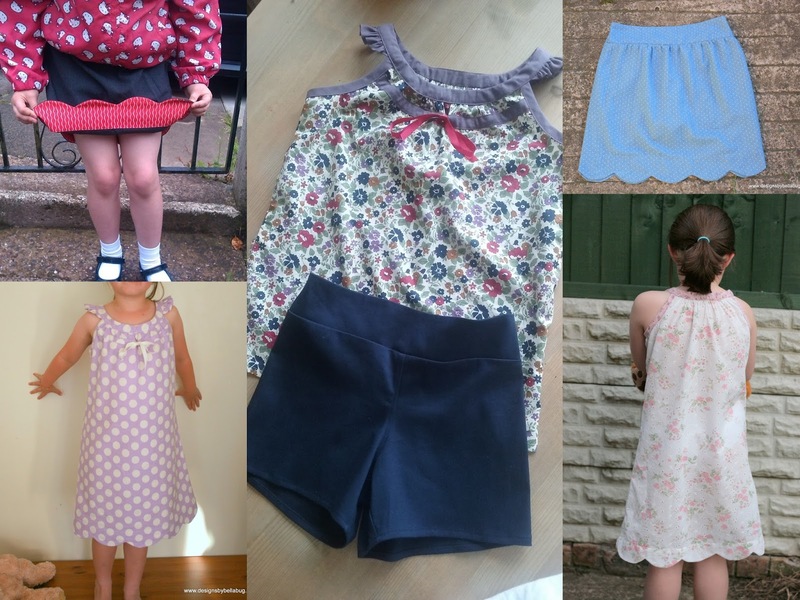 You certainly have made good use of those Oliver + S patterns! Thank you so much Marisa! Likewise, I love looking at your sewing. I wish I had used my Japanese sewing books half as much as you use yours, such beautiful makes!